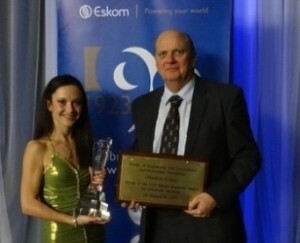 Marilize Everts received the University Award (Open Category) at the Eskom Chairman’s Awards for her outstanding achievement in Engineering. In the Open Category students from all universities and all disciplines are competing against each other. After matriculating from Hoërskool Waterkloof with nine distinctions, Marilize finished her degree in Mechanical Engineering at the University of Pretoria, maintaining an average of 89%. She received an Engineering Council of South Africa medal for most outstanding achievement in the School of Engineering and the C.A. du Toit medal for excellence in the module Heat Transfer. She also won the Sasol merit medals for excellence in design and best Mechanical Engineering student. She was awarded academic honorary colours and is a member of the Golden Key International Honour Society. At present she is doing her masters under the supervision of Prof Josua Meyer, the Head of the Department of Mechanical and Aeronautical Engineering, who was also her supervisor for her final-year research project. She hopes to, one day, do her PhD in Mechanical Engineering.